As a guest of our house you receive the Welcome Card, which allows you to use many offers for free or massive reduced. 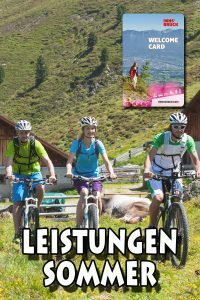 Rental of Nordic walking or hiking poles at the Tourist Information Obsteig, Mieming and Telfs. All of the below-mentoned VVT (regional) buses can be travelled for free within the Innsbruck area upon presentation of the WELCOME CARD. * Route section Innsbruck-Vill-Innsbruck & Innsbruck-Aldrans-Innsbruck: only with valid VVT ticket free and exclusive for guests staying in Aldrans, Ampass, Ellbögen, Lans, Patsch, Rinn, Sistrans, free VVT tickets available in advance at your accommodation. 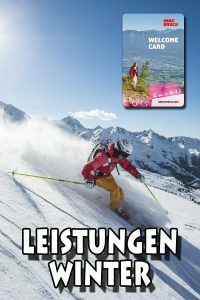 This free public transport service is not valid for the city of Innsbruck (city transport). Further information on mobility can be obtained from tourist information offices or your accommodation provider.